As a responsible car owner, you know that you should get your oil changed approximately every 3,000 miles, and it’s a good fact to know – driving with low oil can cause damage to your car’s engine. 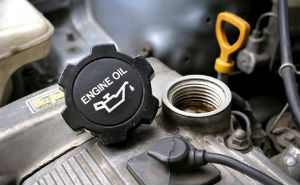 Unfortunately, changing your oil is only a very small component in the larger scheme of auto repair and maintenance. What many car owners don’t know is that there are similar mileage markers that can let you know when to perform other key auto upkeep tasks beyond just changing the oil. Keep this calendar at hand for quick car upkeep reference. Between 3,000 and 7,000 miles, it’s time to check in on your car’s wide array of fluids. Not only should you change the oil (and the oil filter), but you also need to check the transmission fluid, power steering fluid, and coolant. Additionally, you should check your windshield fluid and change your wiper blades at the same time. People overlook those blades for far too long, but they should be replaced regularly. Some of these are easier than others – you can top off your windshield fluid on your own, but it’s generally recommended that you not mess around with your transmission in any way. The transmission is a very delicate part of a car made of hundreds of different small pieces. Instead, mention that you transmission fluid is due to be checked each time you head to get your oil changed. They’ll let you know if any action needs to be taken or if you’re set until closer to 30,000 miles. Finally, no matter how detail oriented and conscientious you are when driving, this 3,000 to 7,000 mile marker offers a great opportunity to just do an all-around inspection of your vehicle. Make sure all your lights are working properly, check your tires, and generally take note of any damage on your car. When you hit 15,000 to 30,000 miles, you’ll also reach several more car repair landmarks. First, at 15,000 miles you’ll need to replace your car’s air filter, and at 20,000 it’s time to check the battery and coolant. In a recent survey, 17% of drivers had inadequate coolant, so it’s important to monitor this. And by making sure you regularly check your battery, you’ll avoid that dreaded morning where you get in the car to go to work and nothing happens. At 25,000 miles, your car will need a new fuel filter, and then at 30,000 it’s time for a series of checks and changes. 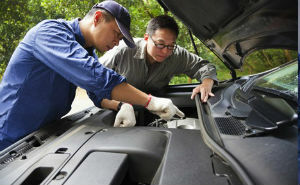 This is the time to check your car’s HVAC system, the radiator hoses, your brake pads, and your car’s suspension. Look for problems like cracking in the radiator hoses that may occur due to cold weather or brake pads that look a little too worn – they should last you to 60,000, but don’t ignore them just because it’s not time yet. Ignoring problems leads to trouble and your brakes are the last thing you want to give out suddenly. At 35,000 miles, it’s time to change your battery if it hasn’t run low before now, and at 40,000 it’s time for new spark plugs and spark plug wires, and time to get your ignition checked out. If you have copper spark plugs they’ll definitely be at the end of their lifespan by this time, though high end iridium plugs can virtually outlast your car, running for as long as 100,000 miles. If you have an automatic ignition, you absolutely need to have any ignition concerns checked by a professional, as even a small mistake can destroy these systems. Additionally, though older spark plugs were a minor risk to DIY car repairmen, newer spark plugs can carry a voltage that’s deadly if you don’t know what you’re doing. When you break the 60,000 mile mark, it’s time to replace your brake pads and brake fluid, your timing belt, radiator hoses, and power steering fluid. Never replace your brake pads on your own, as improperly tested brakes can be deadly, not just for you, but for other people. Auto specialists like those at The Garage Auto Repair have the specialized tools to check your brakes before you hit the road again. For very heavy drivers who watch their cars carefully, you may be able to stretch a few of these measurements out on an alternative timeline. You likely don’t need to check your power steering fluid every 5,000 miles if you cover that distance every few weeks. Instead, unless you begin to feel a problem, you can hold off for the three month mark. Similarly, spark plugs only really need to be checked every 6 months when your car is in constant use. Drivers who cover serious mileage in short periods of time need to be closely in tune with their vehicles, but they have the advantage of knowing the feel of their car intimately. When something changes, it’s clear that something needs to be checked. 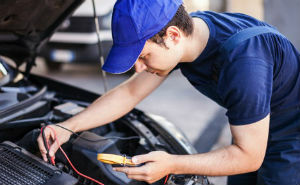 As a car owner, you need an auto repair shop you can trust. That’s why drivers who love their cars turn to The Garage Auto Repair. At The Garage Auto, we believe that every car deserves specialty care. That’s why we have the tools to take on car maintenance concerns both big and small. Whether you’re just due for that oil change or it’s time to get your wheels realigned, The Garage Auto is equipped to do the job right. Contact The Garage Auto today and make an appointment to get your car looked at. Our team of professionals will offer you a straightforward and honest assessment of your vehicle, helping you make informed decisions about upkeep and repairs. We came to Broken Arrow with a combined 80 years of professional experience to treat you and your car right. Come see us for care your car will thank you for. You’ll be surprised how great it feels to hit the road again knowing everything is working at its best.